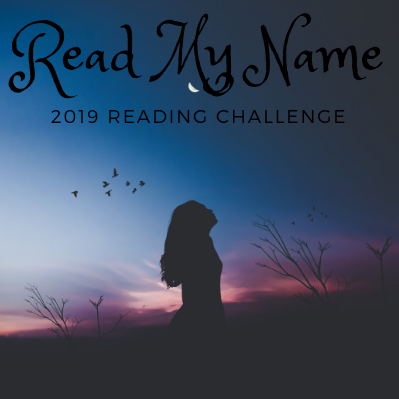 GOAL: Read books with your first, middle or last name as an author name, character name, place name or is about someone of that name. You choose your goal # of books. This challenges goes from Jan 1, 2019 to Dec 31, 2019 and includes all types of books (audio, ebooks etc), rereads are fine and you can choose books as you go or ahead of time. You can overlap books with other challenges. It’s okay if you started a book before Jan 1 as long as you finish it in 2019. You can use your first, middle and/or last name and may include nicknames if you so choose. You don’t have to use the same name for each read or in the same way. You can use maiden and/or married names if you have both. The names don’t have to be spelled the same. e.g. Meagan can read books by a Megan or a Meaghann. So, how many books? Six but only because it's been over a year since I've read much of anything that had an ISBN. Thank you for joining in my reading challenge! I hope you have fun with it.